Bradley Corp. has combined its all-in-one WashBar, a completely touchless handwashing feature, with its line of OmniDecks™. The WashBar adds an innovative and intuitive handwashing element to the OmniDeck's customization possibilities. The WashBar is comprised of a single piece of chrome-plated stainless steel that combines soap, water and dryer in one easy-to-use feature. LED lighting and easy-to-identify icons on the WashBar help to visually orient the user through the handwashing process. A streamlined design eliminates the cluttered look of three separate components. From functional, athletic and strength to combat, Octagon and training, Escape Fitness has launched products across every category from improved favorites to the entirely new. New products include the new Octagon T2, a compact blend of functional frame, attachments and equipment storage—perfect as a hub for small group workouts, with users moving from station to station and tool to tool to get a whole-body workout. Designed for ease of installation and hydraulic efficiencies in commercial aquatic applications, the PS Series™ In-Line Strainer for commercial pumps comes in three standard sizes with the addition of eccentric reducers, allowing them to fit with almost any plumbing configuration. PS Series in-line strainers can accommodate high water flow in a variety of applications. ANSI flange bolt pattern allows for ease of installation and peace of mind. 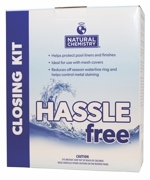 Natural Chemistry's Hassle Free Kit contains two products that set pools up for simple openings. Pool Magic + Phosfree uses naturally based enzymes to break down leftover non-living waste from the pool season, as well as to reduce off-season scum lines. The newly updated kit box also contains Metal Free to control metal staining and scale through the winter without adding problem-causing phosphates. Pool Warden controllers are now offered as a single or dual pool water chemistry chemical controller with the ability to measure pH, ORP, temperature and flow in a T22 version for those that need to comply with California Title 22. The single pool model includes three output relays, and the dual pool model includes six output relays. The unit is easily set up for various types of chemical control, including salt systems, Cal-Hypo suction side, acid, base, heaters and more. Wi-Fi and Ethernet options allow for connection using an Internet-connected computer to view current status and make changes to settings. Green Series Fitness, a Brigadoon Fitness company, recently launched a new adjustable utility bench and three-tier dumbbell rack. 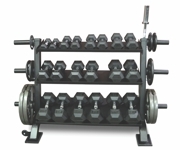 An innovative addition to the Green Series family, the three-tier commercial dumbbell rack offers a unique combination of versatility and durability on a space-saving design. Featuring dual-sided weight bar storage and optional medicine ball rings, it's a great addition to any fitness center. The Green Series bench is built for comfort, durability and affordability in all commercial applications.